Carpet and Pad Pricing Chart - How Much Does New Carpet Cost? How much should you spend on New Carpet? It all depends on how much foot traffic you have and how long you want your new carpet to last. In a Heavy Foot Traffic applications you must buy a higher grade of carpet than if you have a low or medium traffic application. Higher grades of carpet are made with better materials and are designed to tolerate more wear and tear. But the more durable the carpet is... The more it's going to cost you! If you want your carpet to last 20 years, you will need to buy a higher quality carpet than if you only want your new carpet to last just 5 or 10 years. Again, the higher the quality the longer your new carpet is going to last, and the more it's going to cost you. 1. What is Your Level of Foot Traffic? 2. How Long Do You Want Your Carpet to Last? My Carpet & Pad Pricing Charts are designed to help you understand the current cost for new carpet with basic pad based on it's quality level. Now you need to learn exactly what grade, type and style of carpet you need to buy and how to be sure you get a fair & square deal. It's absolutely critical that you buy from a REPUTABLE Carpet Dealer so be sure to check out my List of Preferred Carpet Dealers. Choosing the Right Carpet is not as easy as most homeowners think. There are literally thousands of styles, grades and quality levels to choose from. 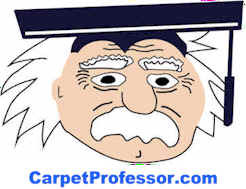 The trick is knowing how to choose the right grade of carpet that is capable of handling your level of foot traffic for the length of time you desire. Any new carpet will look great for the first few months after it is installed in your home, but a poorly made or low-quality carpet will begin to mat down and "ugly-out" very quickly, often within a year or two. Choosing new Carpet today is not as simple as it was 10 or 20 years ago. Not only have prices doubled but there are a lot of new variables to consider. It's easy to make a costly mistake and end up with a carpet that doesn't last, and you should never allow any carpet salesperson to make your carpet choices for you. It's YOUR job to determine your own special needs, goals and budget. Once you know what your level of foot traffic in your home is, then selecting the right carpet should be easy right? Nope! That's why so many homeowners end up buying the wrong carpet and are unhappy with their purchase. It's difficult to tell which carpets are good quality and which ones are poorly made. You can't make your choice based solely on price, appearance or feel alone. You have to take the time to learn what makes one carpet better than another. Don't be duped into paying more for a specialty padding that you don't need! You must select the correct Carpet Padding if you want your new carpet to last as long as possible. Here's several links to my articles about choosing the correct carpet padding. Photos of various Padding Types. Be wary about salespeople who try to convince you to purchase special types padding for pets, moisture barrier, odor eating and extended warranty padding. Learn about carpet padding prices and the cost for padding upgrades. Read my full report about Specialty Pads. Now that you have a basic understanding of the approximate carpet and pad costs involved, half of the battle is over. Make sure you buy from a Reputable Carpet Dealer. See who I recommend near you. Most homeowners experience some degree of "sticker shock" when they discover how much new carpet is going to cost. Unless you have unlimited funds, you might need to save up some more money before you buy new carpet or perhaps do could your new carpet project in stages. The main thing is not to settle for a lower grade of carpet that can't handle your level of foot traffic. That would surely make you unhappy. Read what has happened to other homeowners who made poor carpet choices or bought from the wrong carpet dealer. What Grade of Carpet Should I Select? Take my free Carpet Foot-Traffic Test to see what grade of carpet you need to buy to meet your needs and goals! Carpet cost, carpet prices, cost for carpet, carpet installation cost, homeowner carpet cost, new carpet pricing, how much is new carpet?